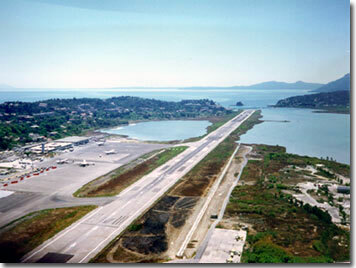 The International Airport of Corfu or Ioannis Kapodistrias CFU is very busy airport at summer time! Thousands of turist are flying in from all around Europe (lets say 60% from UK). After the arrival if they did not book Corfu Airport Transfer to Corfu Hotel or Corfu Resort earlier with travel agency or on their own (Corfu Transfer Online Booking), a lot of them will face difficult choices how to get from Corfu Airport to desired Corfu Location. There is a lot of transfer service providers to get you out of the airport to your destination, but prices for those services on the ground when you arrive could be few times more expensive than if you booked it earlier. Most expensive one is if you use a Taxi. Depending on your destination fare could be anywhere from 20 to 100 Eur. Same thing goes for your return trip. While on the vacation you can get arround with public transportation. Local bus service is good for transfer in the capital and in the suburbs: Afra, Saint Ioannis, Kanoni, Perama, Achillean. Transfer Service for long-distanced cities of the island such as: Lefkimi, Kavos, Karoysades, Glyfada, Saint Georgious North and South, etc.. you can use KTEL buses. There are a lot of car rental options available in Corfu. Corfu car rental depending on the time in holiday season can cost you from 20-50 Eur per day. Again also in this option earlier Corfu Rent a Car Booking will save you a lot of money. I did 3 days on the island of Corfu. Dream as nice. Memories of the island of Corfu have written here. You told you so nice. Thank you. This blog is very well Thanks for posting Keep it up.